My hometown is Emmons, Minnesota, located almost smack dab on the center of the Minnesota-Iowa border, roughly an hour and a half drive south of the Twin Cities. It is primarily in Freeborn County, Minnesota with portions of the town extending into Winnebago County, Iowa and Worth County, Iowa. That geographical quirk worked to some people’s advantages while trying to ditch the local sheriff’s deputy assigned to police duty, or for legally consuming alcohol when Iowa and Minnesota had different “legal ages”. Some of that frivolity is fodder for a future post, though names and dates may change to protect the guilty or irritate the innocent despite the statute of limitations expiring long ago. For some people, going home again is not always easy. Sinclair Lewis wrote two thinly veiled blistering accounts of his hometown of Sauk Centre, Minnesota, “Main Street” and “Babbitt”. Babbitt has nothing to do with the similarly named Iron Range town. Charles Bronson allegedly snarled, “I’d spit on it” when asked about he would do on his next visit to his coal mining hometown in Pennsylvania. My experience is not negative. Hometowns are the source of many firsts when one is growing up: first friends, first crush, first broken heart, first beer, and first unselfish act. Obviously, there is also the ubiquitous first stupid act, but I can safely say there were enough of them to confuse which one was really first, though in my defense, I am using a trinary numbering system consisting of “one”, “two”, and “many”. I left Emmons in July 1975 a few weeks after graduation and have been back sparingly during the past forty years. My 40-year high school reunion was held this weekend in the local VFW hall. I have been back for a few of my high school reunions, but either the reunions were held out-of-town, or I was on a very tight deadline because of work commitments and could not spend any time exploring. I missed the reunion in 2010, so this was the first opportunity to see downtown Emmons during daylight hours in at least a decade. It was also my first chance to visit the farms I lived at and a few other nostalgic landmarks before reconnecting with a special group of people. Interstate 35 (I-35) traverses north and south about seven miles east of Emmons and is a busy expressway connecting Duluth, Minnesota to Laredo, Texas. While it provides a quick route from the Twin Cities, it siphoned off much of the traffic that used to travel U.S. Highway 69 through Emmons, Lake Mills, and Albert Lea. I was driving to Lake Mills for their annual July Jubilee event, so my route extended a few miles farther south exiting I-35 at the Diamond Jo Casino east of Lake Mills. A ten-mile drive on a two-lane pavement brought me to Lake Mills. Country driving is quite scenic, but is also fraught with insects as evidenced by the splatters on my freshly washed car. A large hawk looked up from a raccoon carcass on the shoulder of the road as I drove past, but ignored me otherwise. Gophers scurried across the pavement unknowingly playing chicken. A kestrel sat atop a utility pole enjoying a freshly caught meal. An old saying states that corn plants “knee-high by the Fourth of July” ensure the crop survives until harvest. From what I saw, all the corn was easily thrice that height. Since I was a couple of hours early, I headed north out of Lake Mills on a “minimal maintenance” township road. These roads have gravel or crushed limestone surfaces and can have some serious ruts running across them, which can make handling an open soft drink an adventure. The crushed limestone soon coated my car with a patina of pale yellow dust and the small rocks bouncing off the undercarriage made a sound I had not heard in years as I drove towards a farm my great uncles and great aunts lived on until the mid-1970s. One ironic change I noticed was the southern portion of the acreage south of the gravel road (now called 500th Street) is part of the Hogsback Marsh Waterfowl Production Area. I wonder if anyone had first checked the records to see all the drainage tile we had Les Flo install around 1971 to help drain the peat slough. There was also a large diameter county drain tile installed around 1918 in that area, if I remember the plat map correctly. The gravel pit, which we used as a target range, is now leveled and gone as is the small grove of trees southeast of the farm’s driveway. Many of the rickety outbuildings are gone and the house is actually visible from the road. My car has a HEPA cabin filter in it, which helps remove odors along with filter out particulates and the air conditioner made me forget that July is usually very warm. Opening the car door in the country was different from opening it in Lake Mills. The smells of humid peat, cow manure and pig manure wafted in along with a surprise of damp sauna-like air. The cornfields in the area contributed considerably more humidity to a muggy July afternoon through evapotranspiration. The smells were not oppressive, but they were a humorous reminder of life growing up in an agricultural region. Ah, yes, my first crush. A few miles of driving on some shockingly minimal maintenance roads brought me to the farm on which she grew up. “Washboard road” is a term for a road with multiple ridges in it resembling an old-fashioned washboard. This road was rough enough I drove past a catalytic converter heat shield and later a glass pack muffler, but eventually there was an actual paved road. A deer walked out of the ditch, stared at my oncoming car as if to convey, “What are you doing on MY path?”, and then quickly cleared the ditch and fence with a single easy bound. The farm she grew up on is unrecognizable, but then again, I had not driven past that place since 1975. In case you were wondering, I never did ask her out on a date even though her dad suggested I should. Anyone living farther away than five miles before one has a driver’s license makes for a long distance relationship, and those rarely work. Several years later, we attended each other’s high school graduations and we each worked in IT, but we lost touch shortly after her dad died. The last time I heard from her, she was happily married with kids, and that is the important thing. To this day, she is probably unaware of how I felt about her as I am unaware if the feeling was mutual. Perhaps as a result of not asking her out, I eventually met and married Lucy and had my time of joy. Everything happens for a reason, even if we never discover purpose of the reason. My final stop was a drive past the farm where I spent the majority of my formative years. I had been past there once before in 1990 when Lucy accompanied me to my fifteen year high school reunion. We were running late at the time because I had a late start courtesy of client problem at work. I slowed down and pointed out what features I could at 10 mph on a gravel road, and I recall there were some changes. The pump house and barn were gone and the house was repainted. This time, it appears the house was rebuilt and no original outbuildings remained. The small wooded area was about one-fourth the size. That is not an estimate from a childhood memory but a reasonably accurate guess based upon utility pole distances, which usually do not change. Buildings change but memories do not. The extra hour spent cruising through much of Freeborn, Worth and Winnebago counties on a nostalgia trip started drawing to a close when my vehicle tires met the pavement on State Line Road west of Emmons. I remembered reading about Lime Creek church moving to the “Farming of Yesteryear” site near Kiester, Minnesota, but this was the first time I drove past and saw only the cemetery remaining. There is something disconcerting about a missing familiar landmark, but the church is in use and preserved for future generations. and all moments are renewed. Several buildings exemplifying 19th century architecture are now 21st century vacant lots. The school building sits empty. The “Eagle’s Nest” elevated press box (and a great place to hang out and drink a few brewskis) in State Line Park is long gone. No more barber shop, liquor store, and no grocery stores. The Ford garage is vacant. Even the water tower looks shorter, though I know it is the same water tower that has graced the cityscape since before I was born; maybe the growth spurt I had in college changed my perception. The population slowly declined since it peaked with the 1980 United States Census. Some of the decline resulted from the closing of the meat-packing plant in Albert Lea during the 1980’s and Cummins Filtration in Lake Mills starting outsourcing jobs to Mexico in 2009 and finally shutting down the plant at the end of 2014. Not all the changes are for the worse. A row of houses occupies the old sale barn’s lot. The grain elevator replacement is some grain storage bins, which are easily 100 feet tall and 20 feet in diameter. There are new or remodeled houses scattered throughout the town. Considering the economic downturn severity in the heartland, Emmons is faring well compared to other localities. The liquor store became a library on the upper level with a well-organized, finely curated museum containing a surprising amount of wonderful memorabilia and exhibits occupying the lower level. Another major positive project is the State Line Lake restoration. I was pleasantly surprised to see a lake with clear water, no pond scum, and no algae smell. Many people put forth a lot of effort, the results are remarkable, and everyone involved deserve praise for a job well done. A recently added concrete boat launch in State Line Park and some landscaping work where the old trap club used to be in the 1950s and 1960s are wonderful enhancements. The vibe around town is not one of decline and despair, but a feeling of hope and progress. There is room and opportunity for growth and the vacant lots may once again have buildings on them. I am confident Emmons will be around to celebrate its quasquicentennial in 2024 and its sesquicentennial in 2049. A town is merely a geopolitical collection of building with some level of self-governance. A hometown is part of a person’s heart and soul. As long as people consider Emmons a hometown rather than just a town, it will survive. One change seems to have the most impact on Emmons even though it is not the most visible. The public school district merged with the Glenville, Minnesota school district in 1991, with the Emmons K-12 school becoming a middle school, which was then shuttered in 2003 because of declining enrollment and increasing costs. Nearly a quarter century later, voices dripping in sarcasm and disgust mention the consolidation. Discussing the school closing raises blood pressure and vocal volume. The school mascot and fight song changed. A small town’s identity is usually tied closely to its school, and to a lesser degree, its post office. Closing a school triggers a deep sense of loss. The school is what draws a community together, from the time parents enroll their children, through the sporting events, dances, concerts, plays, and culminating with commencement. Some of the new graduates move away to college or a job elsewhere. Many others stay in the town, get married, start a family, and begin the cycle anew. All involved are part of a very select group, a special community: a graduating class of that town. In my case, that community is the Emmons High School Class of 1975. My classmates and I have belonged, and will belong, to many communities during our lifetimes, but our high school graduating class is the most special because it is our first community, where we learned to cooperate and trust, where we grew up together, and where we became a part of something bigger than ourselves. We even managed to have some fun along the way at Mr. Salisbury’s expense…not that any of us know anything about that! After forty years, our community is still intact. We are all still alive. We have suffered losses, celebrated triumphs, gained wrinkles and scars, and maybe lost some spring in our step or a few extra golf balls in the water hazard, but we have changed the world for the better. We changed the world by producing food, rescuing people in dangerous situations, improving our community through involvement and advocacy, being parents, mentoring future business leaders, helping those battling illnesses, providing comfort, leading a business by example, continuing education, or inspiring others by demonstrating grace, courage and a positive attitude when others would quit. No matter how significant or insignificant one thinks her or his contribution is, that contribution is part of our community. Those contributions when combined form the basis for meaningful change. Be proud of your part in the community and of your contributions. We may have miles and obligations separating us, but we are always together because of our unique bond. I know I’m very proud to be a lifetime member of this elite group. When we think of strength and resiliency, two substances usually come to mind: diamonds and steel. Diamond is the hardest naturally occurring mineral, transforming from carbon undergoing tremendous pressure and heat for millions of years. Steel is an affordable metal alloy that when properly forged can support heavy loads without torsioning into a pile of scrap metal. Like everything in this existence, even the strongest substances fail: diamonds shatter, steel breaks. Nothing in nature is perfect. Naturally occurring diamonds have impurities which affect the crystal’s strength. Imperfect humans make steel. Steel strength varies by ingredients and forging temperature. A slight variation results in the steel being too brittle or too ductile. Our closest interpersonal relationships are much like diamonds and steel. Spouses and best friends are the two closest relationships a person has. Each relationship exists because of absolute trust, absolute openness, and a willingness to sacrifice for the other person. Yet the most important thing, the thing that seems to be a deep secret in any successful relationship, is open, honest, and frequent communication. We all face adversities, we all have bad days, and sometimes, bad things happen to good people. People in close relationships may seem psychically connected to the point of finishing each other’s sentences and anticipating what the other person may say. It does not mean the other person may understand what is occurring. Shutting down, bottling up, or deflecting adds unnecessary pressure to the relationship. Remember what happens when pressure becomes too great: diamonds shatter, steel breaks. There is an old saying that a marriage (or other close relationship) is a 50%/50% proposition. It is actually a 100%/100% proposition. Each party must fully commit to keep the relationship healthy. There will be times when one party is giving 105% and the other gives 95%. Relationships are fluid and evolving because the people entering into the relationship are fluid and evolving. The important thing is to keep striving for 100%, to trust the other party, to find a way to work together through adversity, to forgive imperfections, to not hold on to transgressions, to believe in the other person even when that person does not believe in herself or himself. It is not an easy job, but it is easily the most fulfilling job in the world. Keep your lines of communication open. Be honest, be forthcoming, be compassionate, but most of all, be supportive. Today marks three years since Lucy passed away. Please take a moment to remember her and the joy she brought to our lives. She was an exceptional person and she is deeply missed but lovingly remembered. Her courage and determination during her cancer battle was inspiring, and yet she remained compassionate and generous to those she loved. I have always gravitated towards strong, intelligent women. Lucy was the strongest person I have ever known, and her intelligence made her an ideal partner. I am so grateful to have spent nearly 28 years with her, including 24 years as her husband. Cancer may have stolen her life, but it never stole her spirit, her strength, or her love. That is why I can never say she lost her cancer battle, but rather that her battle ended. Lucy and I had discussed our respective mortalities over a decade before her cancer battle began. Lucy wanted the best for me, but most of all she wanted me to be happy. That is what I wanted for her, too. We put each other’s feelings first, we optimized our time together despite hectic and demanding careers, we took care to not smother each other, but most importantly, we loved and respected each other. I always felt our marriage was a fairy tale come true compared to so many other relationships, and I referred to our time together as our happily ever after. “Time heals all wounds” is an old saying, but it is not at all true. The wound of losing a loved one never totally heals. It does get easier to keep moving forward, but there are still some extremely hard days, like today. I am fortunate to have a great support network because I could not have made it this far alone. I am so lucky to have the love and support of Lucy’s sisters, especially during the first eight months after her passing. They suffered losing their mother, their oldest sister (Lucy), and their father in under a year, but yet they were there for me, and for that I am grateful. Their goodness is because of how well Bob and Betty raised them. I miss Bob and Betty because they accepted me into the family without hesitation and because they were such warm and genuine people. My family has provided a huge amount of support, love, and guidance. They listened to my heartache and sorrow while I tried to make sense of the inconceivable, to accept the fact Lucy was no longer physically here. I am so lucky to have both of my parents still alive and in good health. Even though I am over 230 miles away from my nearest family member, I know they are close to my heart. My close friends rallied around me and are a huge help, too. I may not have many close friends, but I am so lucky to have some truly outstanding ones. All of them have been in my life for over twenty years, except for one, and all of them have bettered my life. Lucy met each of them, except for one, and she enjoyed their company. I am most grateful to my buddy. After we reconnected slightly over two years ago, we went from being friendly, to being acquaintances, to being friends, to being close friends, and now we are best friends. A friendship like that is very curative for a wounded soul, and we will remain friends for the rest of our lives. Career demands conspired to keep Lucy from meeting my buddy, but I know Lucy would have gained another dear friend. My friends have asked if I would consider dating or remarrying. My honest answer is I do not think either will happen, but that I am keeping my mind open. Dating in my teens and twenties was a humiliating and arduous time, and Lucy entered my life as I accepting life long solitude. I’m still a misanthrope, still quite introverted, and really need very little interaction with other people. Trying to make new friends since Lucy’s passing has shown me that unattached women in my age group are either vengeful and bitter divorcees, or have badly broken souls. The really good ones are in relationships, or remain focused on their careers, or are busy with their children or grandchildren, or are not at all interested in me. Perhaps that will change in time, but for the immediate to middle future it is more likely that Earth gets overrun by purple unicorns than me finding someone to date. I may remain solitary for the remainder of my life, but that would not be a terrible fate because solitary does not mean lonely. I have my family, my sisters-in-law, my friends, and my buddy. Lucy set an extremely high bar, and I will not settle for anything less. Be thankful that you have a best friend in your life. That person is there for you in good times and in bad times, to help you mourn or celebrate, but most importantly, to be someone you trust and with whom you enjoy spending time. Those of you who have a special someone in your life are very blessed! Do not miss an opportunity to let that person know what she or he means to you. When giving that meaningful hug to your special someone (who may also your best friend) today, let it linger a few extra seconds for those of us who had our happily ever afters end many years too soon. Thursday was Thanksgiving in the United States. The weather created an unexpected travel challenge into many people’s plans. I-90 from Albert Lea to Fairmont had either ice or snow pack on the roadway. Thursday also saw below zero readings along most of my route. Snow and ice do not melt at -13°F, and road salt quits working at around +25°F. At temperatures colder than -4°F, ice and snow begins sublimating, going from solid to vapor without becoming a liquid, but the process is quite slow. A 3½ hour trip thus became a five-hour trip. Freezing drizzle Friday afternoon meant adding a day to my stay. Today’s warm temperatures, sunshine, and slight breeze melted off the offending ice and snow and ensured an easy drive back home this afternoon. Thanksgiving was not intended to serve as a springboard to the most frenzied shopping time of the year, but to give us a time to pause, reflect, and give thanks. We tend to lose sight of what we have in our life that gives us hope and strength because of fast-paced lifestyles, unsettling news reports, too much caffeine, retail stores opening on Thanksgiving rather than waiting a few extra hours, and too much stress. Each of us has at least one reason or one person for which we are grateful. Several months ago, a “tag, you’re it” style Facebook posting circulated asking the tagged person to list three to five things they were thankful for each day for three to five days, and to tag three to five other people for participation each day (I saw four distinct variations). I disagree with the principle of putting someone on the spot and asking that person to inconvenience between nine and twenty-five of their friends. For some people, the reason or reasons are very personal. The amount of sharing on Facebook can cause someone’s list to get lost in all the chatter and cross talk. A blog is a better forum for a gratitude list, because not everyone has a Facebook presence. My gratitude list consists of people, either groups or individuals. If you have a list to share, please use the “Leave a comment” feature at the end of the posting; you can remain anonymous. Happy Thanksgiving! Three former co-workers are authors published on major imprints, and I look to them for inspiration. Jade Taylor (her nom de plume) wrote a story that Harlequin Romance published. Harlequin is a very difficult imprint for first-time authors because of the amount of unsolicited manuscripts. Lucy enjoyed reading “Wildcat and the Marine”. Those of us lucky to work with “Jade” enjoyed her sense of humor. She was very fun to work with. Elizabeth Hamilton-Guarino wrote two children’s books before writing “Percolate: Let Your Best Self Filter Through” with Dr. Katie Eastman. I worked with Elizabeth at two different companies. “Percolate” was a fun and though-provoking read. Greg Schulz now has three books published focusing on storage networks. Greg worked with Lucy and me over twenty-five years ago. His grasp of extremely complex technical matters and his ability to help others make sense of them makes him a highly sought subject matter expert. Greg is also very personable with a great sense of humor. Each of these authors has distinct writing styles in different genres. Their successes result from connecting with the reader and having the reader feel that the time spent was worth it and enjoyable. It is something I strive for in each blog posting. It takes a lot of courage, planning, and preparation to be one’s own boss. People working a full-time job usually work 40-45 hours per week. Entrepreneurs work at least that many hours, and then work extra hours managing the books, developing the next advertising campaign, negotiating with vendors, doing interviews, handling shipping and receiving, and many other essential tasks. It is not for the faint of heart or for someone wanting to ease into a new career, especially in a still fickle economy. Carver Flowers is a great example of pursuing a dream and dedicating the time for the dream to become a reality. Annette and Al have done an outstanding job building their business on trust and quality along with showcasing Annette’s talent and creativity. MBF_MSC Virtual Administrative Services is an example of seeing a need and developing a business fulfilling that need. Mary does quality work, is very enthusiastic, and works tirelessly at growing her business and giving back. It is so gratifying seeing these businesses succeeding. They admirably represent the American Dream. Public safety does not take time off. Firefighters, police, snowplow drivers, first responders, and dispatchers routinely work weekends and holidays. The Highway Patrol busily cleared accidents Thursday. Some of those accidents required dispatching an ambulance or fire truck. Snowplows did what they could to keep the roadways passable, though there were areas where the ice and snow accumulated too quickly. Public safety workers sometimes deal with the worst in humanity, or get dispatched to a tragedy. Yet many of them stay with their jobs for many years because they know they are helping others. Lucy’s cancer battle required dedication and compassion from several dozen healthcare professionals. Lucy and I have nurses in our extended families. I also have friends who are doctors. It takes thousands of hours of training, followed by passing board exams and licensure to begin either career. One difficult part of the job is knowing not everyone receiving care has a positive outcome. Nurses in particular tend to dying patients, diligently focused on making that person as comfortable as possible, while being compassionate to that person’s loved ones. Lucy always thanked her doctors and nurses because she was grateful that they were doing their best while caring for her, including the emergency room doctor who told her that her battle was ending and there was nothing more that could be done for her. It takes a special person to become a doctor or nurse. Hospice workers are very special. They tend to a person transitioning from this life, and they help the remaining loved ones begin adjusting to losing that person. Lucy’s hospice workers were professional and compassionate. Her hospice nurses were incredibly supportive of me while I helped tend to Lucy in her last days. The hospice team gave Lucy the chance to be at home, surrounded by her loved ones, in the house she loved. It was an incredible gift. Your comments and criticisms help me be a better writer, and your continued readership gives me confidence to continue. All of you help me be a better person. I hope you get something enjoyable and entertaining out of my musings. I have a small immediate family which unfortunately became one smaller nearly eighteen years ago. My two surviving brothers live over 250 miles away from me, in opposite directions. They remain a big part of my life. I am fortunate to have a large and loving extended family. My cousins are supportive, wacky, intelligent, compassionate, and a very fun part of my life. Most of them live fifteen hundred miles away or farther from me, but each of them holds a special place in my heart. Like many of you, I have endured a number of physical challenges. I won’t even try to estimate the number of hours I spent in general anesthesia, much less physical therapy or lying in a hospital bed. I have a dear friend who easily eclipses my numbers, so I know how lucky I am. It took a lot of work to put Humpty Dumpty back together. My career in IT was three decades of high stress work with constant career reinventions because the technology changed rapidly. Yet I am in surprisingly good health and fitness, though I could improve on the fitness part. Love and sacrifice. My parents gave up so much while I was spending a chunk of my early years in the hospital. Dad worked a full-time job and ran a farm so Mom could raise my brothers and care for me. Most of my surgeries and recoveries happened in Rochester, about eighty miles from home. They made a lot of trips for me. I was a huge challenge for them. It took a number of years before it sank in what they sacrificed for me, but I am lucky it did sink in, and I am still awestruck. 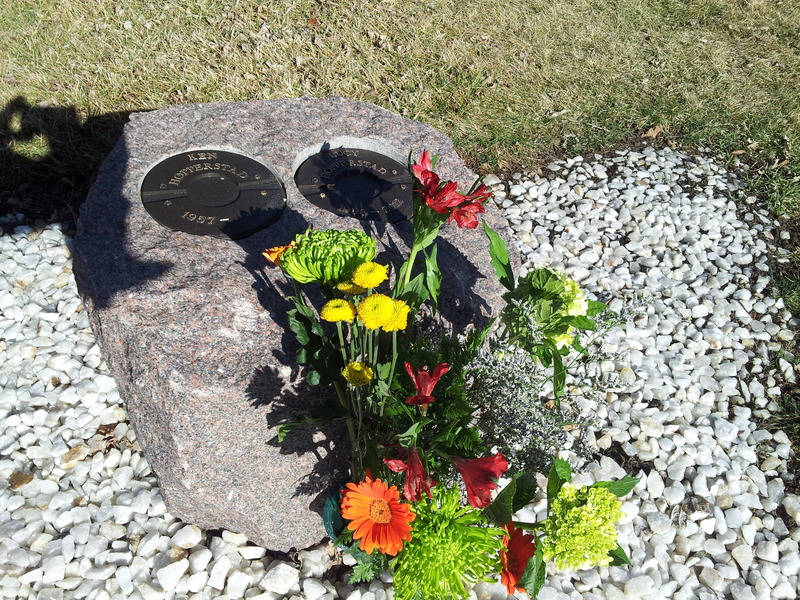 They are still both alive and recently celebrated their 58th wedding anniversary. I love them dearly! Everyone needs a support system and my close friends have helped get me through the past thirty-one months since Lucy passed away. Friends are best measured by quality rather than quantity, and I hit the jackpot with mine. These are people I trust, with whom I enjoy spending time, who generously listen, and offer advice when I need it. Lucy’s passing is a difficult adjustment. I am extremely fortunate to have one close friend who has invested (and still invests) a lot of time with me, who gets me out into the world, who challenges me to think, gets me to laugh, helps inspire me, shows genuine interest in how my day is going, and is a lot of fun being around. That is the sort of person who can brighten a day with a simple text message or a long phone call, and I do my best to reciprocate, though I think I have the better end of the deal. Most of the nearly 90,000 words written in this blog are reasons I am thankful for her, yet I would need a few million more to adequately describe my gratitude. I still miss her and I will for the rest of my life. She was my best friend, my rock, my confidante, my inspiration, my sounding board, my passion, my joy, and my universe. She was my once in a lifetime windfall of good luck. Even though she is no longer physically here among us, she remains a part of me. My life is better because she was part of it and she still keeps me working on becoming a better person. In closing, I have many blessings for which I am grateful. You probably have many blessings, too. As a reminder, if you wish to share some of the things you are grateful for, please feel free to leave a comment on the blog site. If you are lucky enough to have a special someone in your life, give that person a long and meaningful hug to let him or her know how much you love them for making your life better. Give your loved ones a hug when you get a chance and I hope you enjoyed your holiday! In the Upper Midwest of the United States, autumn is the season with the most dramatic changes. Peak fall color is about a week or two away from the Twin Cities metro area and it appears the fall colors will be the most vibrant in many years. The past several years have seen unfavorable conditions for fall color. Too much wind, too much heat, too early a snowfall, or too little rain contributed to sub-par colors. This month has seen several of my friends starting new jobs in the next couple of weeks. I have noticed that September and October seem to be peak times for intra-company job postings. From my management days, I performed nearly all my performance reviews in October. Most corporations in the United States have a fiscal year that follows the calendar year. Fourth quarter budgets most often had salary increases and bonus line items. It helped with budgeting for the next fiscal year. In one friend’s case, the new job originated with a chance conversation with someone in a different department. Corporate decision-making often times proceeds at a glacial pace and slowly builds momentum. When one is working in a high-pressure environment with uncooperative team members, the glacial pace seems never-ending. That story had a happy ending Friday late afternoon with a celebration Friday evening. Celebrating someone’s good fortune is always pleasant. Celebrating while dining outdoors in perfect weather is even more pleasant. This year’s weather had a dearth of perfect days. Last night was a Goldilocks evening. It was not too cold, not too warm, not too windy, no bugs and no precipitation; it was just right. Today’s stronger breezes caused the ash trees to start raining down yellow and ocher colored leaves forming a thin blanket on the ground. Maple trees and sumac bushes have noticeably more color. Squirrels have turned lawns into something that looks like cluster bomb testing took place. Even though the days are warmer than average, the shorter days and low humidity cause the temperature to drop rather quickly after sundown. Change is in the air. Congratulations to everyone starting a new job or retiring. Good luck on your new adventure. Whether you are experiencing early autumn or early spring, I hope your weather is pleasant and you get a chance to enjoy the changes.